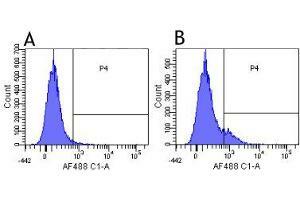 Flow-cytometry using the anti-CD131 research biosimilar antibody CSL311 Human lymphocytes were stained with an isotype control (panel A) or the rabbit-chimeric version of CSL311 (panel B) at a concentration of1 µg/ml for 30 mins at RT. After washing, bound antibody was detected using a AF488 conjugated donkey anti-rabbit antibody (ab150073) and cells analysed on a FACSCanto flow-cytometer. Specificity This antibody binds to CD131. Immunogen Human CD131, also called the cytokine receptor common subunit beta. Application Notes This antibody binds to the common beta chain of the IL3-, GM-CSF- and IL5-receptor and prevents binding of the corresponding cytokines to these receptors and resulting in pro-inflammatory signalling as assessed by inhibition of TF-1 cell proliferation and STAT5 phosphorylation. This chimeric rabbit antibody was made using the variable domain sequences of the original Human IgG4 format, for improved compatibility with existing reagents, assays and techniques. Buffer PBS with 0.02 % Proclin 300. Storage Comment Store at 4°C for up to 3 months. For longer storage, aliquot and store at -20°C.